If you're a fan of comfort dressing when it comes to your personal style, you'll love this cute pairing of a light blue embroidered dress shirt and a red quilted leather crossbody bag. When it comes to footwear, this getup pairs wonderfully with tan suede ballerina shoes. If you're all about comfort dressing when it comes to your personal style, you'll love this stylish pairing of a red coat and a Sole Society linza faux leather crossbody bag. Go for a red knit turtleneck and a red quilted leather crossbody bag, if you want to dress for comfort without looking like a hobo. You could perhaps get a little creative when it comes to footwear and elevate your ensemble with red leather pumps. Reach for a white chiffon shift dress and a Sole Society linza faux leather crossbody bag, if you want to dress for comfort without looking like you don't care. You could perhaps get a little creative in the footwear department and spruce up your outfit with white leather pumps. 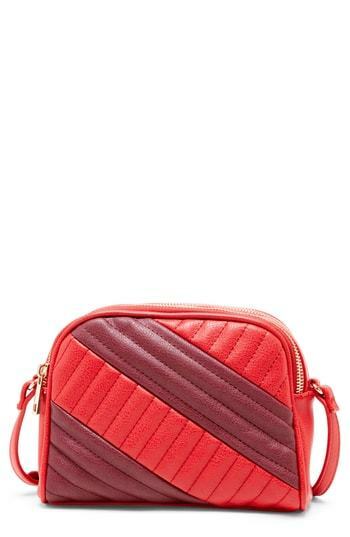 Pair a red knit casual dress with a red quilted leather crossbody bag for a casual get-up. Add grey leather loafers to your outfit for an instant style upgrade. We're all ensembleing for comfort when it comes to dressing up, and this combination of a black fur jacket and a Sole Society linza faux leather crossbody bag is an amazing example of that. Throw in a pair of black suede pumps to instantly up the chic factor of any outfit. We're all ensembleing for comfort when it comes to dressing up, and this combination of a navy crew-neck sweater and a Sole Society linza faux leather crossbody bag is a perfect example of that. Kick up the cool of your look by rounding it off with tan leather pumps. Rock a red floral cardigan with a Sole Society linza faux leather crossbody bag if you're scouting for an outfit idea for when you want to look casually cool. You could perhaps get a little creative when it comes to footwear and spruce up your ensemble with red suede pumps. If you're all about relaxed dressing when it comes to your personal style, you'll love this cute pairing of a black sweater dress and a Sole Society linza faux leather crossbody bag from Nordstrom. Spruce up your ensemble with red velvet over the knee boots.